The Kemetic Round Table is a group of Kemetic-centric blogs that discusses issues and concerns of interest to Kemetic practitioners and is aimed at beginners, but those of us who might have been at it a while. Disclaimer: Please note that because I am rather new to this whole WordPress blog thing, I am posting my links manually – at least for this post to the Round Table. It isn’t that I can’t do it like everyone else, it is just that I haven’t quite figured it out yet. I am more than willing to fully admit to my inadequacy in this particular area. 😉 Any and all help would be greatly appreciated. It seems that the more connected we become in this digital-centric world, where things are up for instant consumption and there is a constant compare and contrast, the more disconnected and inadequate that we can tend to feel. Even we, who are in groups or temples that are long-lived and well-established, feel this. So do those among us who have had a decade or more of working both within the community and as individuals. That fear of somehow being found out as a “fake” or “not doing it right” can be debilitating. There seems to be an all-too-human tendency to compare what we do with what others are doing. If a fellow Kemetic, also with the same Deity line up that we have has a skill that we don’t personally share, it’s easy to feel as if that Deity is somehow “playing favourites.” The truth is, each of us are Their favourites, and none of us, regardless of what we might think, ever sprung from the womb being a perfect Kemetic. All of us who are Reconstructionists tend to grasp every shred, every scholarly resource we can. 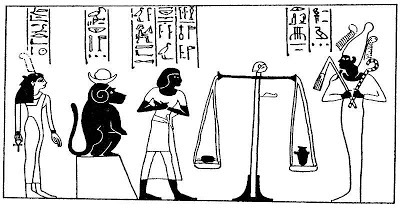 Many of us secretly desire to dedicate study to not only the Netjeru, but also to learning ancient Egyptian hieroglyphs and somehow phoneticizing them so that we can incorporate these Medw Netjer, writing of the Gods, into our own rites. Wouldn’t it be great to have our own language that marks us as being Kemetic? Perhaps if we remember that the literacy rate in ancient Kemet was far lower than it is today. And while we may holistic civilisation that ever existed, we have advantages in our time that should not be unappreciated. We can appreciate this fact even if it is that ancient faith of our akhu that calls to the deepest part of our kas. It speaks to us on a deep level and yet, it is easy to feel distant from them and from how it really was in antiquity. The fact of the matter, as others have pointed out, we are not ever going to be able to completely reconstruct what went on before, as much as we may want to. Ancient Kemet is gone. It lives in our hearts and as a part of our collective human history and heritage – for all of humanity came from Africa. We may not feel as if we are enough because we haven’t got the perfect statue for our Gods or the right altar or shrine or ritual space constructed yet. We may have to be content to wearing street clothes while doing our daily rites, rather than dedicated ritual garments, and somehow, there are always those niggling doubts that creep in because of our not having everything “just so”. All that stuff is just extraneous and trappings to the real concern that we must all feel from time to time. Are we enough? Can we sit down in ritual space, get quiet in that place or even pour our hearts out to Netjer? Sometimes when we do go there, we bring with us a lot of self-indulgent crap. We are human and this self indulgence can be part and parcel of how we processes our feelings and emotions in a spiritual sense. Personally, I have always felt that the idea of a Divine Parent or Parents and Beloveds spoke to the idea of a family. Within our families, ideally, we can be ourselves even in the face of personal feelings of inadequacy. Being in Shrine, for me, is a lot like coming home and telling my Mother how my day went, or about my hopes, fears, resentments, hurts and yes, even what I would consider to be my inadequacies. In Shrine, it is what is considered ‘safe space’ and it is alright to feel weepy or needy or just contemplative. In that safe space we can come to terms with the reasons why we might feel inadequate. Sometimes, when we least expect it,and when we need it most, that still small voice comes to us and we realize that the feeling of being inadequate has started to dissipate because we have come to realize that everyone starts at the beginning. Those personal practices that we carve out for ourselves and where we have far fewer performance anxiety, are probably, in my view, much more important than the group rituals that the Kemetic community does in celebration of various festival days. While that personal time might not address our very human need toward community involvement, what it does do is help build a foundation for those times when do come together with others. During those times we find that everyone ends up feeling at least a little inadequate. Time, however, has a way of making that be less of an issue for us and we learn to appreciate the place that we are in and come to realize that once we get our bearings, those feelings of inadequacy begin to dissipate. I made a private post of my own while having some kind of similar thoughts recently. I think that if there is a right, or correct way to venerate Netjer, it’s with love and humility. We all still share the same sun, wind, and stars. These Gods don’t just belong to the ancients, nor to those who try to mimic temple practices. They belong to us all. I would agree with that sentiment.